E-Mail Newsletters - Books, Movies & More! The Lied Bookmobile Schedule gives the locations, times and lengths of the Lied Bookmobile stops. The Lied Bookmobile visits regular stops every two weeks. Holiday closings are listed at the bottom of the schedule. In case of stop cancellation due to weather or mechanical difficulties, due dates will be adjusted. The Lied Bookmobile carries adult and juvenile fiction and nonfiction, magazines, DVDs and videos, audiobooks on tape and CD, computer games, and large print titles. Requests for items not currently on the Lied Bookmobile can be made by placing holds through the library’s online catalog, by calling any library location, or by submitting titles to Lied Bookmobile staff. Please allow several days before your stop for items to reach the Lied Bookmobile when placing holds. The Lied Bookmobile carries adult and juvenile fiction and nonfiction, magazines, DVDs and videos, audiobooks, music CDs, video games, and large-print titles. Please bring your library card with you to check out items at the Lied Bookmobile. 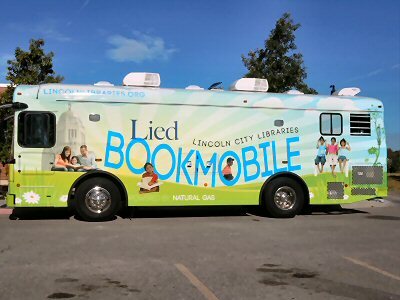 Most items on the Lied Bookmobile are loaned for a 4-week period, with one renewal allowed.To renew, stop in or call any Lincoln City Libraries branch, or call the library’s automated telephone renewal line at 402-441-8506. You can also view your library record, place holds, and renew items through the library’s online catalog. For further information on the Lied Bookmobile, call 402-441-8545. Route A stops are shown with blue markers; Route B stops are shown with yellow markers. E-Mail Newsletters – Books, Movies & More!